Karina Oakley surprised many when she was found to have an IQ of 160 – the same as Stephen Hawking and six points higher than Carol Vorderman – which makes her eligible to join Mensa. 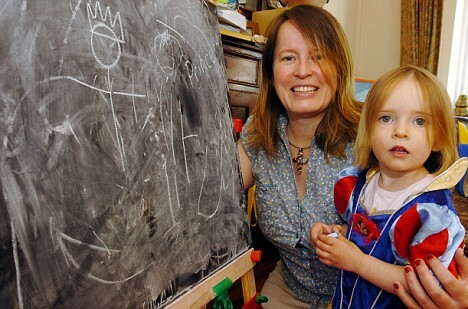 The brainy tot, who is almost three, is in the top 0.03 per cent of children her age, placing her on a par with a four or five-year-old. Her mother Charlotte Fraser says she knew her daughter was bright, just not that bright. She decided to have Karina tested by Professor Joan Freeman, a specialist education psychologist, after watching a TV show about child geniuses. The 45-minute IQ test asked the pre-schooler to complete challenges in verbal ability, memory, handling a pencil and numbers and shapes. At the end, the professor found that she had a special bias towards words, with a ‘wonderful imagination’. The professor noted that Karina gave imaginative responses to questions. For instance when asked, ‘What do you use your eyes for?’ she answered, ‘You close them when you go to sleep’ and then also said, ‘You put your contact lenses in them’. IQ scores are derived by evaluating how well a subject does compared to others of his or her own age. A perfect age match would result in an “average” score of 100, while a 6-year-old who had the same results as an average 9-year-old would score 150, or “genius” level.